Get a Gel Pro Mat to stand on when doing chop/prep or working at the stove. Use a BBB 20% off coupon to purchase. I have two and would not consider going without. They make it so much more comfortable on the feet and back. May save some time chopping but a horrific pain in the rear to clean.. Wait a few minutes longer when heating up cast iron. Freeze all your "waste" when cutting veggies, herbs and such instead of throwing it away. Once you have a large stash, take it out and make veggie stock with it. I second latex gloves. It is pretty important when chopping really spicy peppers. The juice from habaneros just getting on your fingers can burn. Can also help prevent cross contamination. This. I use gloves every time with peppers. Also I use with meat, because frequent hand washing dries out my skin badly. Wear gloves, rip off when done and your hands are still clean. The rubber gloves are critical for me when handling raw meat, especially chicken. I do while chickens (spatchcock, beer can, etc.) and it requires some handling before putting the rub/clean up and having gloves saves me from having to wash my hands multiple times before the bird even gets to cooking. Also I use with meat, because frequent hand washing dries out my skin badly. I'm the same way. I can't recommend O'Keeffes Working Hands enough. No smell, not greasy, absorbs quick and works wonders. If you have ever cut and a potato and air fried it with disappointing results try this instead. Cut potatoes in thick wedges and boil for 5 minutes before air frying. They will be much crispier on the outside and more moist on the inside. Seasonings stick to them much better as well. I can't recommend O'Keeffes Working Hands enough. That is my go-to hand cream for dry, cracking hands and I use it every winter when the air, and my hands get dry. I love to throw darts and I will apply some before heading out to toss some darts with friends since dry hands don't grip the dart as good and they will sometimes slip on release. O'Keefe's really helps and is non-greasy like many hand creams/lotions. One trick that I was very suspect of but I have since been proved wrong / humbled by my fiance about, is when making roux she will brown the flour in the oven first. She spreads desired amount evenly on a cookie tray and places in oven at 350degrees for ~30 minutes or so, forking it to spread / move it around every 10 minutes or so. It comes out a tan color, not very dark, but cuts the amount of time required to cool / brown in the oil significantly. As mentioned I was extremely suspect, but I can taste no difference in the roux from this method compared to how I used to do it traditionally, ie not cooking flour in the oven first. This allows me to get almost all of my prep work done while the flour is in the oven, and then I only need to spend ~15 minutes cooking the roux compared to alot longer when I added the flour 'raw'. Oven roux is becoming common around here. Not just the flour, the entire roux cooked completely in the oven. One thing that really bothers me watching other people cook, especially if their knife isn't as sharp as it should be, is chopping bell peppers. Yes, it makes sense to a lot of folks to cut skin-side up...flip the pepper over and cut inside out. The knife, even if dull, will go through the peppers like butter. Not a trick but I think one of the things that saves the most time in the kitchen is cleaning as you go. Dull knives...You hit a sore spot there. I do some of the cooking at my in-laws. Every one of their knives has seen about 300 cycles in the dish washer. I got frustrated trying to use their knives, so I keep a cheap Moraknife in my backpack and take it every where I go. You don’t use soap on wooden cutting boards? A table near a waiter. 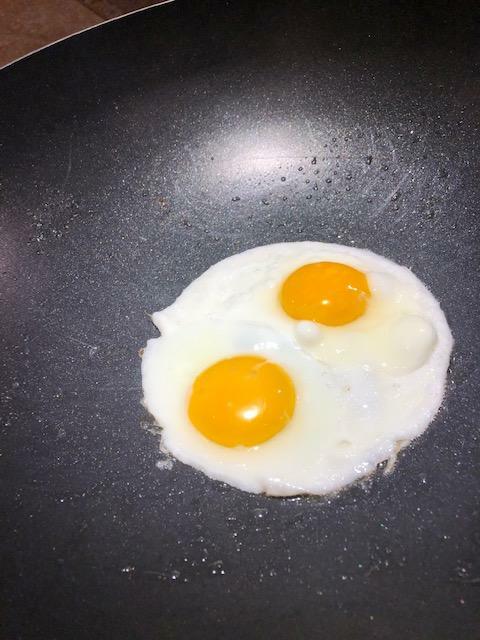 Fry eggs in a non-stick wok for perfect symmetrical appearance. Wait, people chop bell peppers skin side up? I seent it! It's much more common than you ever want to know.